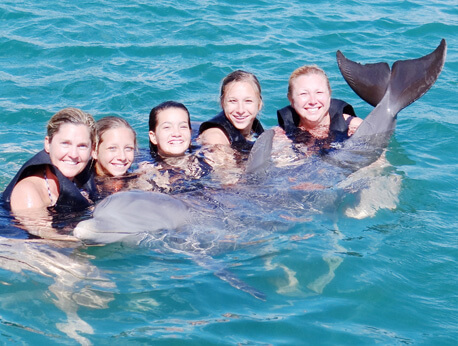 The Dolphin Swim Adventure at Cove Cayman is an interactive tour that is appropriate for most age groups. Children and adults alike will be taken to the cove where dolphins provide entertainment for all of their guests. You will be able to swim with and be kissed by the dolphins. It will truly be a most memorable occasion that you are not soon to forget. When in the Caribbean, there are many cool and exciting tours to take part in. In fact, the entire area is a playground for children and adults alike. Perhaps one of the more unique and unforgettable experiences anywhere on the planet, however, is to be found in the Dolphin Swim Adventure tour. This is the one excursion that you must consider scheduling into your vacation. The swim adventure takes place at Cove Cayman. When scheduling this tour, which is available for any member of your family, you do not have to worry about getting there. Transportation is included. You will be taken to a natural dolphin habitat where you will be afforded the opportunity to interact with these smartest of marine animals. No, you can’t take one home with you, but you can certainly swim and play with them as much as you’d like throughout the 30-minute tour. You will be most happy that you did. The Dolphin Swim Adventure at Cove Cayman is designed to be an interactive experience that puts you face-to-face with fun-loving dolphins that will entertain and amaze you. When you arrive, they will almost certainly greet you with their fins. This is only the beginning of what they have in store in for you. Because dolphins thoroughly enjoy human interaction, they are more than willing to play with adults and children alike. There is no need to be afraid. Just be yourself and enjoy the experience. Providing all of the equipment that the little ones need to be safe, even children are able to swim and enjoy the dolphins. These marine animals are very gentle around humans, and they have a special affinity for children. You and your kids will be kissed, hugged, and serenaded. The tour also includes a belly ride and boogie push from your dolphins. Where else on earth can you claim to have not only seen dolphins, but been able to swim with them as well? Prepare for the adventure of a lifetime. Your special moments will be captured via digital prints made by a professional photographer. These will be available for purchase after you have worn yourself out playing with the dolphins. There is also a restaurant to have a beverage and a meal, as well as a retail shop. This is a day that you will remember for a lifetime.